LOWER EAST SIDE — A local tattoo parlor owned by TV personality Megan Massacre is slashing its prices and wait-times for one day to raise money for dogs and cats in need of homes. Clients at the Lower East Side's Grit N Glory tattoo shop typically wait months to a year to get an appointment and prices start at $200. But on Sunday, New Yorkers can walk into the 186 Orchard St. shop and get a small, animal-related tattoo for half the price — and with no appointment. Proceeds from each $100 tattoo will go to the ASPCA as part of the organization's newest adoption event called "Tats 'N' Tails." Owner Megan Woznicki — known as Megan Massacre for her stints on TV shows including "America's Worst Tattoos," "NY Ink," "Secret Societies of Hollywood" and MTV's "Girl Code" — will be drawing up the tattoos herself, along with her team, from noon to 4 pm. "It is a very discounted rate for my shop," she told DNAinfo New York on Wednesday. "For the caliber of artists and for the level of work you're getting it's definitely a discount." Woznick was still working out what designs she'll be doing that day, but said that customers will be able to choose between black ink and color, and can get it placed anywhere except the neck or face. Her past work can be seen on the parlor's website. Cats and dogs in need of a home will also be at the parlor on that day, including 8-month-old Wilbur (seen below on right) and 4-year-old Trusty (left), according to ASPCA officials. When deciding to participate in the event, Woznick said she thought of when she adopted her own black cat, named Fernet. "I love Fernet to death. A lot of times, people think shelter animals may not be as healthy as store bought, but they're healthier and need loving homes," she said. "You're also making space for other animals in the shelter. The fact that I can use what I do best, my artwork and my name, to raise awareness is great." Customers are invited to bring their dog and run them through an agility course that will be set up outside the store. Anyone who adopts an animal at the event will get a free tattoo and T-shirt and will be entered to win a $1,000 tattoo by Megan Massacre. 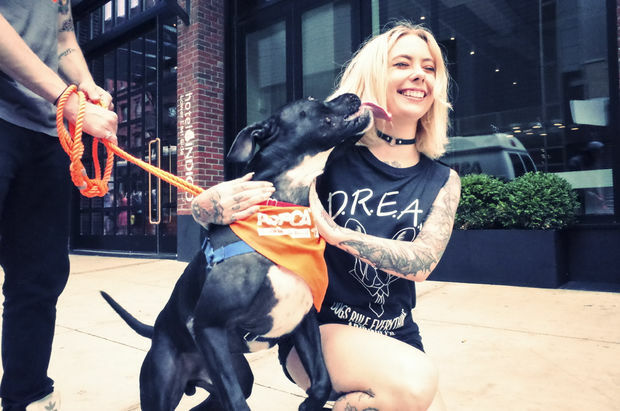 “The ASPCA is thrilled to work with Megan Massacre to find loving homes for animals in need," said Gail Buchwald, senior vice president of the ASPCA Adoption Center. "Megan’s passion for animals and desire to utilize her talents and influence to raise awareness about the importance of adoption is very honorable."